Chronic kidney disease (CKD) outcomes, including progression to end stage, is influenced by patient treatment and is known to be suboptimal. A commercial database was analyzed to assess practice patterns and conformance to clinical practice guidelines among nephrologists and non-nephrologists who care for patients with advanced CKD (estimated GFR [eGFR] ≤30 ml/min per 1.73 m2). Data from 1933 adults with advanced CKD on the basis of prestipulated inclusion criteria were analyzed. Individuals were designated as in a nephrologist or non-nephrologist group depending on whether a nephrologist was involved in their care. With the use of published guidelines, conformance to 10 recommendations was assessed for all patients and separately for the nephrologist and non-nephrologist groups. The average eGFR of included individuals was 23.6 ml/min per 1.73 m2. A majority were female and older than 65 yr. Non-nephrologists treated approximately half of all patients and a greater number of women and patients who were older than 65 yr. Nephrologists treated patients with a lower eGFR, equal numbers of men and women, and an equal number of individuals younger and older than 65 yr. Nephrologist conformance to guidelines was systematically better than that of non-nephrologists. These analyses reveal that a large number of patients with advanced CKD are being treated solely by non-nephrologists and that nephrologists treat patients with more advanced disease. Management of advanced CKD is suboptimal for all patients but is particularly poor for patients who are treated solely by non-nephrologists. The prevalent population of individuals with ESRD is projected to increase from 325,000 in 2003 to 660,000 by 2010 (1). The prevalent population of individuals with chronic kidney disease (CKD) is estimated to be at least 20 times that number (2,3). Treatment of individuals with CKD is clinically multifaceted and is known to be suboptimal (4). Patients with more advanced disease present an even greater challenge as a result of metabolic derangements, rapid progression of disease, and manifestation of factors that relate to poor outcomes (5,6). Meanwhile, the sheer number of patients with CKD makes it impossible for nephrologists alone to assess and provide care adequately for this group of individuals (1). For optimization of care, it is essential that a practice improvement strategy that involves all clinicians who treat patients with advanced CKD be devised. Measuring current practices and comparing them with a standard of care that is recommended by clinical practice guidelines (7,8) provides important preliminary information for devising such a practice improvement strategy (9). We used a commercially available database that included administrative and laboratory data to assess practice patterns of physicians who treated individuals who had advanced CKD (i.e., CKD stages 4 and 5) and were not yet on dialysis or had not received a transplant. We were interested in practice patterns of both nephrologists and non-nephrologists. Treatment was deemed to be appropriate when there was conformance to specific guideline recommendations for patients with advanced CKD (8). Data were obtained from PharMetrics (Watertown, MA), which maintains an integrated set of adjudicated medical and pharmaceutical claims for all covered services for approximately 40 million commercially insured patients and 58 health plans. The files include information regarding enrollment, demographics, medical claims, pharmacy claims, and laboratory results. From the approximately 500,000 enrollees with laboratory data available, PharMetrics provided us with an analytic file that consisted of 22,300 individuals with at least one serum creatinine ≥1.5 mg/dl. 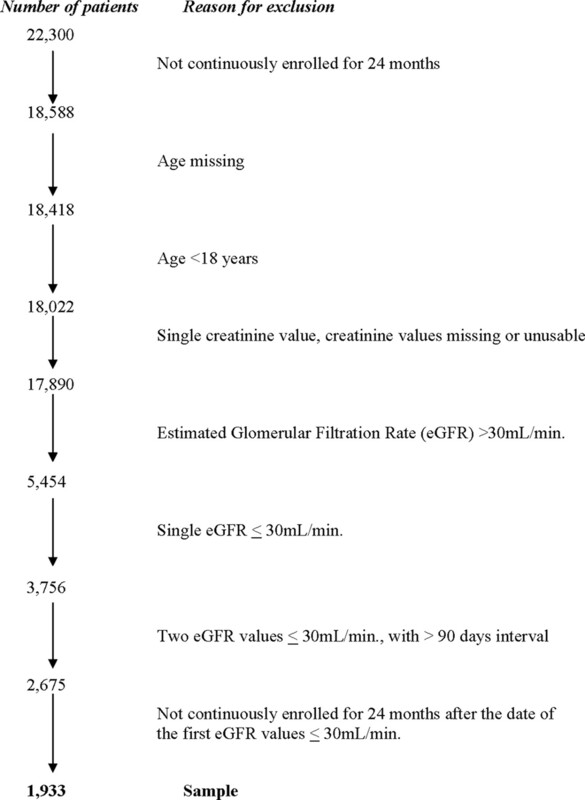 After permission was obtained from the Duke Institutional Review Board, adults with advanced CKD were identified from among 22,300 individuals with a serum creatinine of ≥1.5 mg/dl using the following inclusion criteria: (1) Age ≥18 yr; (2) continuous enrollment for ≥24 mo; and (3) two estimated glomerular filtration rates (eGFR) ≤30 ml/min per 1.73 m2, separated by an interval of at least 90 d after the first eGFR ≤30 ml/min per 1.73 m2. A total of 1933 patients met these criteria (Figure 1). The modified Modification of Diet in Renal Disease (MDRD) equation, which has been validated in patients with CKD, was used to calculate eGFR (1,10). Derivation of sample for analysis. From the recommendation statements of the treatment guideline for patients with advanced CKD, we selected 10 recommendations that could be assessed using the PharMetrics data (Table 1). We categorized each individual on the basis of the degree of nephrologist involvement in his or her care. To accomplish this, we first counted the number of laboratory tests ordered or claims processed, including visits (denoted “procedures” in the data set) for each individual. We assigned each individual to one of two categories: (1) Nephrologist patients, defined as individuals who had a record of any procedure ordered by a nephrologist, and (2) non-nephrologist patients, defined as individuals who had no record of any procedure ordered by a nephrologist. For each of the two categories of patients, we calculated the extent of guideline conformance. We determined whether each specific recommendation statement was applicable to each individual (“eligible recommendation”) and, if so, whether the recommendation was satisfied. Recommendations that involved a single decision per physician (e.g., whether a complete workup was performed for anemia) were assessed using a χ2 test, applied to the 2 × 2 table of physician type (nephrologist, non-nephrologist) versus guideline adherence (adherent, not adherent). For recommendations that involved multiple decisions per patient (e.g., whether hemoglobin was monitored every 3 mo), follow-up was divided into intervals (e.g., for hemoglobin monitoring, the intervals were in units of 3 mo), then a patient-specific adherence score was created by dividing the number of intervals during which the physician was in compliance with the recommendation by the number of possible intervals (e.g., if the patient was followed for 10 intervals and hemoglobin was monitored in nine of these intervals, then the score was nine of 10). These patient-specific adherence scores (a continuous measure) were then compared (between nephrologists and non-nephrologists) using a t test. Of the 1933 individuals who met our inclusion criteria, the majority were female (61%) and older than 65 yr (63%). Comorbidities were common, ranging from 41.7% with chronic obstructive pulmonary disease to 92.7% with hypertension (Table 2). A total of 67% of individuals had a Current Procedural Terminology code for CKD. The average eGFR was 23.6 ml/min per 1.73 m2 (Table 2). More than half (59%) of all patients had at least one visit or procedure reflecting some degree of nephrologist involvement in their treatment (designated “nephrologist” patients). Most nephrologist patients had multiple interactions with a nephrologist (data not shown). Patients who saw a non-nephrologist were more likely to be female and older than 65 yr. Patients who saw a non-nephrologist were equally likely to be male or female and older or younger than 65 yr. When we examined the first eGFR for all patients after they met our eligibility criterion of eGFR ≤30 ml/min per 1.73 m2, we observed that nephrologists treated patients with a lower mean eGFR as compared with non-nephrologists (21.8 [SD 7.4] versus 26.2 ml/min per 1.73 m2 [SD 3.7]; Table 2). When all patients with advanced CKD were considered, the lowest level of conformance was observed for referral for vascular access placement (11.6%). The recommendation to which most physicians conformed was related to a complete workup for patients with anemia (75.9%; Table 3). When patients who were treated by nephrologists and non-nephrologists were considered separately, conformance was best for complete anemia workup for both groups (83.9 and 63.1%, respectively). The poorest levels of conformance for both nephrologist and non-nephrologist groups were for referral of patients with advanced CKD for a vascular access placement (18.1 and 2.4%, respectively). For all of the recommendations assessed, nephrologists’ conformance to advanced CKD guidelines was consistently higher and systematically better than that of non-nephrologists. This difference was statistically significant for all but one recommendation (treating for iron deficiency). Treatment differences were most striking for recommendations related to referral for vascular access placement (18.1 and 2.4%, nephrologists and non-nephrologists, respectively) and monitoring for parathyroid hormone (PTH; 43.7 versus 6.5%). Our analyses revealed that a significant proportion (41%) of our patients with advanced CKD were treated solely by non-nephrologists. We also note that patients who were treated solely by non-nephrologists were not coded for their CKD approximately three fourths of the time (Table 2). It is interesting that nephrologists were less likely than non-nephrologists to treat patients who were older than 65 yr. Nephrologists also treated patients with more advanced disease, as evidenced by their first eGFR subsequent to the date when they were determined to be eligible for this analysis. Our analysis revealed a higher prevalence of chronic obstructive lung disease, which may reflect either the advanced age of our sample or that the sample that we analyzed carries a higher burden of lung disease than expected. As judged by our analysis of the extent of conformance to the advanced CKD recommendations, non-nephrologists who treated patients with advanced CKD were less likely to conform to guidelines than nephrologists who treated this group of patients. This was true especially for clinical areas that are specific to advanced CKD, such as prescribing erythropoietin for eligible patients, monitoring PTH levels, and referring for vascular access placement. Non-nephrologists’ management of anemia was more consistent with guidelines than their management of other clinical areas. An exception was the low levels of erythropoietin prescriptions for patients subsequent to appropriate trial of iron. Our finding supports earlier research that suggests that erythropoietin is not generally prescribed in a non-nephrologist setting (6). However, the level of conformance that was observed in our analysis should be considered in light of the fact that fewer numbers of patients were eligible for erythropoietin in the non-nephrologist pool. This may reflect a pattern of erythropoietin need as a trigger for referral to nephrologists. The process by which we selected the final sample of 1933 patients is unlikely to have yielded a sample that is systematically different from the 22,300 individuals who were included in the database that we received for analysis; however, we cannot confirm this assumption. Furthermore, our selection process has not affected our final conclusions regarding the differences in advanced CKD management practices between nephrologists and non-nephrologists. Our analysis had some important limitations. Some of these are common to all analysis that involves administrative databases, including their reliance on administrative codes that do not distinguish between comorbidities and complications (11,12). In addition, the PharMetrics data had its own limitations that were relevant especially for the recommendations that were included in the advanced CKD guideline. For example, some of the advanced CKD management recommendations call for taking action if the results of a laboratory value reach a certain threshold. However, the laboratory data set that we used did not include all laboratory test results of interest (e.g., performance of PTH, vitamin D level was available but results were not). In addition, the data set does not include all of the information that is required to make an accurate determination regarding the temporal sequence of monitoring and subsequent actions taken; this was required for some recommendations. Furthermore, the claims data do not contain any information regarding the dosage of medications prescribed to establish clearly that some guidelines have been followed. These limitations of the database led us to exclude a number of guideline recommendations from our analysis. For recommendations that were amenable to analysis but for which there was any ambiguity, we overstated compliance. Despite these limitations, the direction of the comparative performance of nephrologists and non-nephrologists is valid as long as the biases in the database and our analysis are unrelated to the type of provider. Neither the administrative data nor the laboratory data set included values for BP. This precluded us from evaluating the management of hypertension, although other investigators have shown this area to be managed suboptimally (6,13). Similarly, although it is important to estimate the extent to which veins are preserved in preparation for dialysis (14) or whether patients are referred for a transplant evaluation in a timely manner, it was not possible to evaluate these parameters accurately within the confines of available data. Furthermore, seven of the 10 recommendations that we assessed relate to monitoring laboratory levels. Therefore, our definition of advanced CKD “management” is restricted to management as related to some but not all recommendations in five of seven clinical areas (anemia, bone disease, nutrition, dyslipidemias, and timing of renal replacement therapy) that are covered by the advanced CKD guideline. Although we could not assess other recommendations regarding subsequent treatment of these patients, it is unlikely that the significant number of patients who are not monitored regularly would be treated appropriately when treatment is based on results of monitoring. It should also be noted that in this analysis, one claim from a nephrologist qualified a patient to be categorized as a nephrologist patient. We do not distinguish between patients who received a one-time consult from a nephrologist and patients who were treated solely by a nephrologist. However, most nephrologist patients seemed to have significant nephrologist involvement. Despite these limitations, our analyses lead to several important conclusions. First, a large number of individuals with advanced CKD are being treated solely by non-nephrologists. This is either out of necessity (lack of nephrologist availability) or because of lack of awareness regarding the need for nephrologist referral. Second, management of advanced CKD is suboptimal, irrespective of whether patients are treated by nephrologists or non-nephrologists. Third, advanced CKD management is particularly poor for patients who are being treated solely by non-nephrologists. In addition, our results indicate that the impact of noninvolvement of a nephrologist is especially striking for CKD-specific issues such as referral for access placement. These conclusions regarding poor conformance to advanced CKD guideline recommendations are not surprising. Several researchers have studied practice patterns for management of CKD and have documented a variety of problems with predialysis care (6,15,16). In areas other than CKD, levels of guideline conformance have been low as well (17–20). The problem has been attributed to several factors, including lack of awareness of or familiarity or agreement with recommendations, inertia of previous practice, and lack of time required for implementing guidelines. In addition, environmental barriers such as reimbursement levels and patient-level barriers related to insurance status, education, and self-management behaviors affect guideline adherence (17–20). Before the publication of formal guidelines for the care of patients with CKD, a study revealed that the care that is rendered for such patients in nephrology outpatient clinics was suboptimal (15). Our findings support earlier research suggesting that nephrologists treat patients with advanced CKD more appropriately than do non-nephrologists (5,15,21–23). However, our analysis demonstrates that there remains an opportunity for improvement in the care of these patients by nephrologists as well. Optimizing CKD care has the potential to delay progression and improve outcomes should renal replacement therapy be required. A recent study projected that if the rate of decline of GFR decreased by 10, 20, or 30%, then the cumulative health care savings through 2010 would be $9.06, $19.98, or $33.37 billion, respectively (24). Considering these projections and our results, two important questions need to be answered if progression of CKD is to be slowed: How can we equip non-nephrologists to participate more effectively in the treatment of the increasingly large population of CKD patients? How can we improve the care that is provided by nephrologists to individuals with advanced CKD? We propose that some steps be taken in this direction. Recent evidence indicates that interactive educational activities that include enabling material (e.g., concise guidelines, patient education material) promote subsequent uptake of guidelines (17). Therefore, conducting experiential workshops for nephrologists and non-nephrologists should raise their awareness regarding the rising incidence of CKD, problems that are associated with late identification of the condition, methods of identifying and screening high-risk individuals, critical aspects of advanced CKD management, and the relevance of involving nephrologists in management. Evidence also suggests that the nontrivial task of implementing guidelines to optimize management can be accomplished through multifaceted tools (17,25,26). Making providers aware of the existence of treatment tools for patients with advanced CKD and encouraging their use through workshops and symposia should influence optimal management of advanced CKD. We consider the role of professional societies and governmental agencies as particularly important in these implementation efforts. Conducting interactive and experiential workshops that are linked to national primary care meetings may be a cost-effective strategy for conveying important messages. In coordination with these nationally organized efforts, individual nephrologists can produce a powerful impact through transmission of information during formally or informally organized meetings with primary care colleagues. The National Kidney Disease Education Program and other professional organizations have developed educational tools with this goal in mind (1,27). As our results indicate, opportunities for improvement of management of advanced CKD by nephrologists also deserve attention. Nephrology professional societies could address this challenge through conducting symposia and workshops that focus on improving CKD management. These activities should emphasize the importance of improving the nephrologist–primary care physician interaction while providing or referencing resources that assist the process (1,7,8,27). Innovative use of electronic medical records technology should provide added momentum to these attempts. Whatever the means used to optimize treatment of patients with advanced CKD, the urgency of these efforts cannot be underestimated. This project was funded by the Renal Physicians Association. We acknowledge the assistance of Rebecca Gray in editing the manuscript. See the related editorial, “Handing Out Grades for Care in Chronic Kidney Disease: Nephrologists versus Non-Nephrologist,” on pages 193–195.